Qualifications & Experience: General Nursing & Midwifery plus Diploma in Oncology Nursing with 1 year clinical experience in a 50 bedded hospital OR Basic or Post Basic B.Sc. 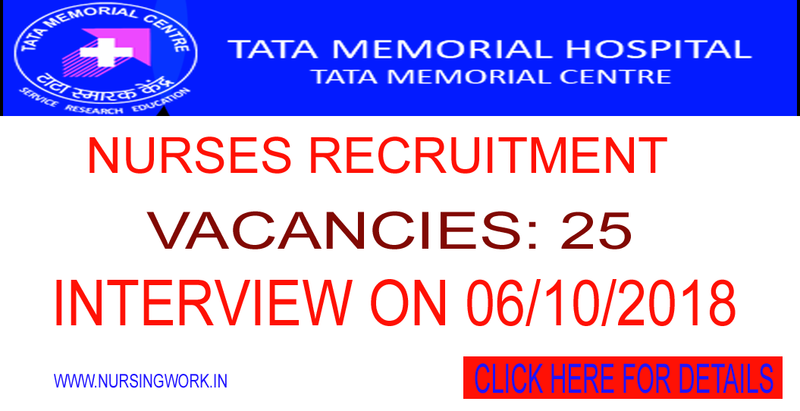 (Nursing) with 1 year clinical experience in minimum 50 bedded hospital. Candidates should be eligible to register with Indian Nursing Council / State Nursing Council. Candidates who have done Diploma in Nursing Oncology and served the entire bond period will be given relaxation in age by 5 years. Hepatitis Vaccination should be completed. Working pattern will be 6 days a week. General Nursing & Midwifery & Basic or Post Basic B.Sc (Nursing) should be recognized by Indian Nursing Council / State Nursing Council. Interested candidates may come along with Bio-data, recent passport size photograph, zerox copy of PANCARD, original certificates and one set of attested copies of all certificates.